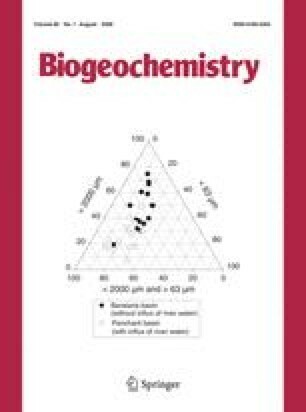 To help evaluate effects of Mississippi River inputs to sustainability of coastal Louisiana ecosystems, we compared porewater and substrate quality of organic-rich Panicum hemitomon freshwater marshes inundated by river water annually for more than 30 years (Penchant basin, PB) or not during the same time (Barataria basin, BB). In the marshes receiving river water the soil environment was more reduced, the organic substrate was more decomposed and accumulated more sulfur. The porewater dissolved ammonium and orthophosphate concentrations were an order of magnitude higher and sulfide and alkalinity concentrations were more than twice as high in PB compared with BB marshes. The pH was higher and dissolved iron concentrations were more than an order of magnitude lower in PB marshes than in BB marshes. The influx of nutrient-rich river water did not enhance end-of-year above-ground standing biomass or vertical accretion rates of the shallow substrate. The differences in porewater chemistry and substrate quality are reasonably linked to the long-term influx of river water through biogeochemical processes and transformations involving alkalinity, nitrate and sulfate. The key factor is the continual replenishment of alkalinity, nitrate and sulfate via overland flow during high river stage each year for several weeks to more than 6 months. This leads to a reducing soil environment, pooling of the phytotoxin sulfide and inorganic nutrients in porewater, and internally generated alkalinity. Organic matter decomposition is enhanced under these conditions and root mats degraded. The more decomposed root mat makes these marshes more susceptible to erosion during infrequent high-energy events (for example hurricanes) and regular low-energy events, such as tides and the passage of weather fronts. Our findings were unexpected and, if generally applicable, suggest that river diversions may not be the beneficial mitigating agent of wetland restoration and conservation that they are anticipated to be. David Muth and the late Robert Belous of the National Park Service (NPS), Jean Lafitte National Historical Park and Preserve (JELA) provided essential support. Continental Land and Fur, Inc., Metairie, LA. provided access to the Penchant Basin marshes. JG Gosselink, K McKee and RE Turner reviewed and helped improve early versions of this manuscript. The work was supported by JELA and a USGS/NPS water-quality partnership. Any use of trade, firm or product names is for descriptive purposes only and does not imply endorsement by the U.S. Government.